These solar-powered metal cacti mysteriously migrated to a landscape far different from their origins. This sculpture garden is an oasis in the Wrong Desert. Originally created for 2018’s Burning Man festival, this installation uses mainly recycled materials, including steel pipe, aluminum, and motorcycle tires. 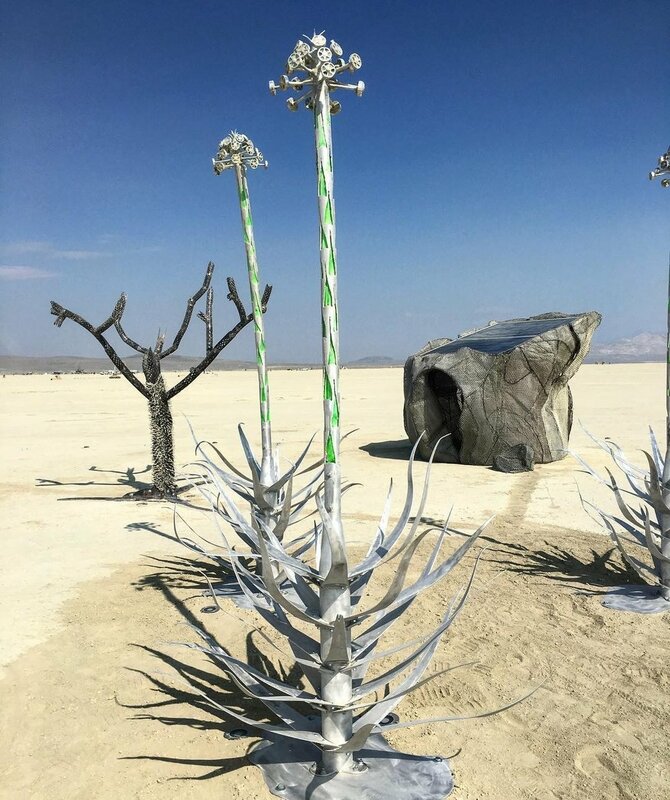 A steel Cholla cactus is the centerpiece, surrounded by aluminum agave plants and glowing steel boulders, the largest of which has a cave inside! Solar panels integrated into the boulder provide all of the power needed for the installation’s LED lights. Just like real cacti, these “plants” can survive on their own using only the abundant resource above them: sunlight.